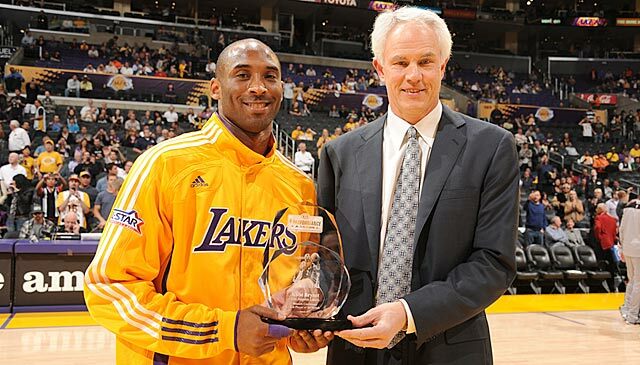 Lakers guard Kobe Bryant poses with General Manger Mitch Kupchak. Los Angeles is known for its great movie stars, dramas, comedies, and all of that however they’re not used to it taken place on the court. Now everyone knows the Shaquille O’Neal and Kobe Bryant drama that took place back in the early 2000’s. Where they won three championships together and then came the shocking downfall ending with the unbelievable divorce of the dynamic duo. However, the drama died down in Los Angeles after that, at least for the most part. Now of course they still had the buzzer beaters, the close losses, the blowout wins, the blowout losses and all of those dramas, but the he said, she said dramas, they were gone. Though don’t blink now as the drama of Hollywood and the Los Angeles Lakers is back. Starting with the Chris Paul trade veto, everything went down hill from there. 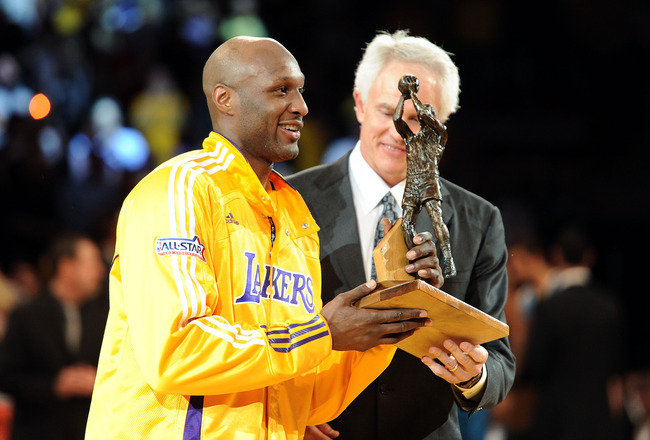 Lakers forward and sixth man of the year, Lamar Odom was traded to the Dallas Mavericks, forward Pau Gasol remained in trade rumors, and the losses began to pile up. Though post game comments wasn’t all as the Lakers held a team meeting that was organized by both Bryant and Lakers guard Derek Fisher. After addressing the issue of the Pau Gasol trade rumors on Sunday night, the Lakers who dominated the Portland Trailblazers on Monday night, looked like a whole new team, like the Lakers. Which made it clear that Bryant’s comments made a difference. So while to some this may look like a player making ignorant comments to his boss or a player making comments out of anger after a loss, in reality these comments may have just turned around their team’s season. 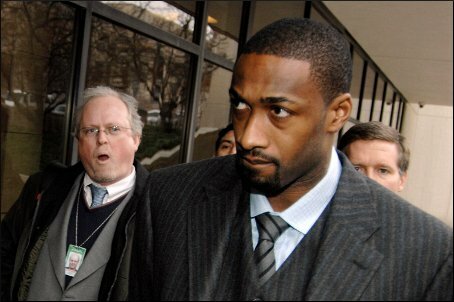 Gilbert Arenas to the Lakers? After rumors died down of free agent guard Gilbert Arenas going to the Los Angeles Lakers over the past couple weeks they sparked back up again today as over the weekend, Lakers General Manager Mitch Kupchak held a private workout for the free agent guard. After failing to gain a young point guard during the off-season, after a trade which was accepted to bring in former New Orleans Hornets guard and now Los Angeles Clippers guard Chris Paul, the Lakers are now going after Gilbert Arenas…well at least it seems that way. Now many have been saying that the Lakers have needed a young point guard to come in as Derek Fisher who will turn 38 this year just isn’t cutting it as so far this season the Lakers have allowed 14 points a game to starting point guards. That’s just starting point guards, which as we know some of those starters aren’t scorers and as we also know some of those starters split time. Like for instance, the Philadelphia 76ers where Jrue Holiday and Lou Williams both share the roll and when the Lakers played them the two combined for 37 of their teams 95 points and they were also the two leading scorers for the sixers. Now the Lakers aren’t a bad a defensive team as they rank fourth in the NBA in points allowed at 90.9 points per game. But 14 points a game to just starting point guards? That’s a lot. Though, despite the poor point guard play from the Lakers, they have been okay this season as they sit at 16-12. However the concern of a point guard acquisition is huge as even guard Kobe Bryant knows it, the one who some have been saying urged the workout of Gilbert Arenas. It certainly wouldn’t hurt at all as out of the 12 losses that the Lakers have had they allowed opposing starting point guards to score 17 points a game and even more points a game when including backups. The Lakers front office have been apt of making moves when Bryant has requested before, like when they acquired forward Pau Gasol from the Memphis Grizzlies. So will Gilbert Arenas be a member of the purple and gold? Or will he remain in the free agency waiting for an opportunity to spark up again? Michael Jordan vs. Kobe Bryant the debate that will never end. Since the NBA Lockout ended, Los Angeles Lakers guard Kobe Bryant has always been a top the news of the NBA. Rather it being his surgery that he had during the off-season, the question of if he’ll win another ring, the comparison to Miami Heat forward LeBron James or the ESPN pre-season rankings that put him as the seventh best player currently in the NBA. Looking back at those rankings now Bryant who’s averaging 30.8 points per game and is the NBA’s leading scorer is anything but seventh in the NBA as he’s proving yet again this season that he’s clearly the best. As it stands right now Bryant has four of the five top single game points in one game for a player this 2011-12 season, as it goes his 48 point game against Phoenix, Orlando Magic’s Dwight Howard with 45, then Bryant’s 42 against Cleveland, his 42 against the Clippers, and his 40 against Utah. However seventh is where ESPN felt he stood. As for Michael Jordan who many claim was the best to ever touch a basketball didn’t feel that Bryant was the seventh best player in the NBA as he not only felt that Bryant was the best, but the only player that deserved to be compared to him. What more do you need than the approval from the G.O.A.T. (Greatest Of All Time) Michael Jordan than to say that he’s the best in the NBA? Apparently ESPN didn’t think so as they put LeBron James, Dwight Howard, Dwyane Wade, Chris Paul, Dirk Nowitzki, and Kevin Durant all ahead of Bryant. Taking all of what Jordan said and what Bryant has done thus far this NBA season, I wonder what ESPN would say now? Would they still keep him at seventh? Or would they move him up to where he should be, at number one? All questions that may never be answered, but it doesn’t matter as they don’t need to be answered, as Michael Jordan and Bryant’s performance this season have already answered those questions. 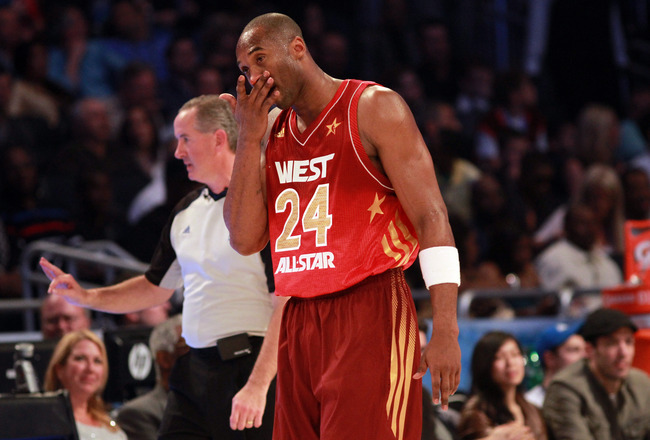 Will Kobe Bryant Win The 2011-12 NBA Scoring Title? Or Will The Wrist Injury Hurt Him? Bryant drops 48 points aganist the Suns. Kobe Bryant came into 2011-12 season with high hopes after under going an experimental surgery on his knees that he said restored him to new as many people close to Bryant have said that he looks young again. However in a pre-season game against the Los Angeles Clippers, Bryant would take a hard fall to the ground falling on his wrist, though he wouldn’t come out. That wrist injury would later be diagnosed as a torn ligament in his right wrist which is Bryant’s shooting hand. According to Web MD, wrist injuries of this severity require either surgery or a cast/splint and sometimes even both. As far as the timetable of how long the recovery would take, could sometimes be a year. However in most cases it takes about usually six weeks. As soon as news broke of the injury, many began speculating on how much time Bryant would miss and if he would play in the season opener. Though come Christmas day, Bryant would play in the season opener and would play well scoring 28 points, grabbing 7 rebounds, 6 assists, and two steals in a one point, 78-77 loss to the Chicago Bulls. Picture of the fall Bryant's wrist took. On January 6th against the Golden State Warriors last Friday Bryant would score 39 points in a 97-90 win over the Warriors and would score the most points in a single game for any player in the NBA for the 2011-12 NBA season. Then just four days later, Bryant would score 48 points against the Phoenix Suns in a 99-83 win breaking in his former record of 39 points for the 2011-12 NBA season. The next closest player to Bryant’s 2011-12 single game season record is Warriors guard Monta Ellis who scored 38 points against the San Antonio Spurs on January 4th. The Lakers have played 11 games this season so far and Bryant has played in every single one of them. As far as his play, it’s been great as he’s averaging 29.4 points, 5.7 rebounds, and 5.8 assists a game. Bryant is currently second in the NBA in scoring behind Miami Heat forward LeBron James who’s averaging 29.6 points per game in just nine games. However James doesn’t have a severe wrist injury nor is James 33 like Bryant is. Though age aside, once Bryant’s wrist heals in say a couple more weeks Kobe Bryant will win the scoring title this 2011-12 NBA season. Heck, he could probably win it with his wrist injury. “I think he’s a player that has remarkable will to fight through anything. And he proved it today by being out there. By not even questioning the fact that he might not play. He’s a fighter. He’s a warrior. He’s out there and he’s the leader of this team, so it’s important for him to do that,” teammate Pau Gasol told ESPN after the Lakers season opener against Chicago. You even gave him the award...what were you thinking? After not getting guard Chris Paul from the New Orleans Hornets, forward Lamar Odom would demand a trade. Odom would demand a trade as he felt that he was disrespected as he felt that he should’ve never have been traded. So as a result Odom would be dealt to the Dallas Mavericks for $8.9 million in trade exception, as well as a protected first-round pick. This would cause some controversy as fans would respond with shocked remarks like, “why would they do that,” “what were they thinking,” etc. However they weren’t the only to respond as captain guard Kobe Bryant did as well saying, “I don’t understand the criticism of [the] reality shows…he had his best season last year. It clearly wasn’t a distraction,” Kobe Bryant told NBA reporters. They might not have had a better opportunity? Mr. Kupchak, do you really feel that trading your fourth leading scorer, third leading rebounder, and sixth man of the year to the defending Champions as well as the team that swept you in the playoffs for $8.9 Million in trade exception and first round pick, the best opportunity? You’re crazy and personally I don’t think that you as the Lakers General manager give the Lakers organization the best opportunity to win. You trade Shaquille O’Neal, you traded Caron Butler for Kwame Brown, then you didn’t re-sign Trevor Ariza, and now you trade Lamar Odom, what’s next Mitch Kupchak? Kobe Bryant? Now this all could’ve been prevented and I’m not talking about Shaquille O’Neal, Caron Butler, and Trevor Ariza (though they could’ve been prevented too) but I’m talking about Lamar Odom; you could’ve done better. What you could’ve done was first; try to convince him to stay. You could’ve told him that it’s a business and that anyone can get traded at anytime, however your sorry that you made the mistake and you feel bad and then you throw him extra money pat him on the back and say see you on the court. Now if that didn’t work you could’ve gone to the stage of trading him; except not to the Dallas Mavericks. What you should’ve done was have waited and tried to trade him to the Orlando Magic to get center Dwight Howard, wouldn’t that have been smart? Instead, you trade Odom to the Dallas Mavericks and get pretty much some money and a first round pick and you take no talent from their team, all you did was make them better…a lot better. As a result now your Los Angeles Lakers are not the best team in the West as the Dallas Mavericks are, but your Los Angeles Lakers now might not even be the best in Los Angeles as the Clippers made some moves that might put them at the top dog status. So my question to you Mr. Kupchak is what are you doing? 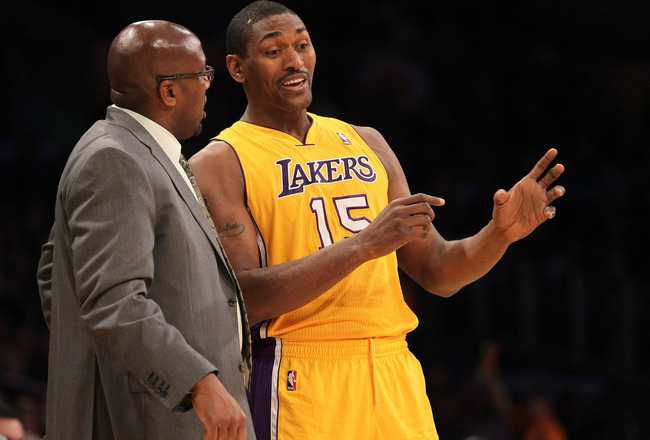 Why would trade Odom? And why would you trade Odom, to the Dallas Mavericks? Why wouldn’t you just wait and trade him to the Magic for Howard? Wouldn’t that have made a lot more sense?